A typical Energy Management Software (EMS) solution is also known as a DDC (Direct Digital Control) system or Building Automation Control software. A typical solution consists of number of devices and controllers that are installed onto a specific set of equipment, networked together and then programmed utilizing a front end software program. 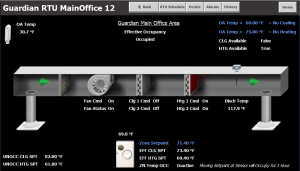 This provides end user with access to their HVAC system allowing the ability to monitor and control the equipment. HVAC (heating, ventilation and air conditioning) and lighting equipment are two of the most common systems that are considered for automation. Most HVAC and lighting systems are controlled by manual or simplistic programmable devices that offer limited capabilities and very little information on the system’s actual performance. Design and engineer a new system. Design and engineer around an existing system. Install, program and commission the new system. Develop strategies around your system to reduce energy usage. Most utility companies offer an incentive to buy down the cost of installing a new Energy Management Software system, or expand an existing system.